Something to Muse About: Announcing For Steam And Country by Jon Del Arroz! 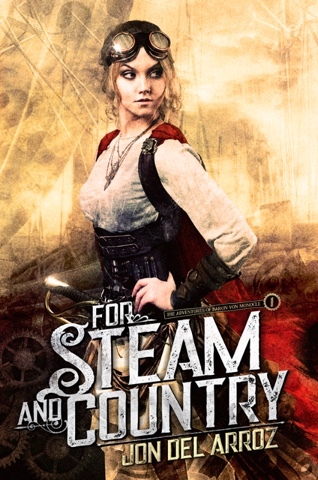 Announcing For Steam And Country by Jon Del Arroz! Fight for Rislandia with The First Book in the Adventures of Baron von Monocle series by Jon Del Arroz and Superversive Press. Superversive Press to release hot new Steampunk adventure by leading Hispanic science fiction author Jon Del Arroz. Superversive Press is excited to announce For Steam And Country, the new steampunk fantasy novel, set for release in June 2017. Six people in dark clothes descended from the side of the ship’s hull, rappelling down long ropes. They hollered like maniacs, brandishing guns and swords. Our guard stumbled backward, mouth agape. He shook where he stood, staring at me. His Wyranth uniform had several holes in it. Before he could do or say anything else, he fell to the ground. Blood pooled around his body. I dragged my feet and backed away. Bile rose in my throat faster than I could suppress. I’d never seen a dead man before, let alone one killed so brutally. The six commandos from the airship dropped to the ground. They spread out, five of them circling around me and James. One I recognized as Marina, but the sixth member of the party surprised me — Captain von Cravat. She glowered at me, but her attention shifted when more shots rang out. ` One of the Liliana’s commandos collapsed. The three Wyranth soldiers who had left stood with their guns trained on us, using a nearby tree as cover. My rescuers returned fire, several shots hitting one of the Wyranth soldiers in the shoulder. He fell. The other two Wyranth soldiers wasted no time. Major Anton moved the quickest, charging the circle of my rescuers. His companion fired his gun behind him to cover him, keeping Major Anton from getting shot. Before I could think to yelp, Major Anton had a knife to my throat. Jon Del Arroz is the author of the Alliance Award nominated and top-10 Amazon bestselling Space Opera, Star Realms: Rescue Run, which as a debut novel sold more than three thousand copies. He is a well known blogger who has been featured on The Federalist, Mary Robinette Kowal’s My Favorite Bit, and the Hugo Award nominated Castalia House blog. Del Arroz came to prominence in early 2017, when he exposed a local science fiction convention for blackballing him from speaking over his identity, and as an independent journalist, breaking the story about Marvel Comics’ bad business practices. Superversive Press is a young publisher of science fiction and fantasy. Their anthology, Forbidden Thoughts sold over six-thousand copies and is known for making every author in the book an Amazon Top 100 Bestseller. With titles like The Product by Dragon Award nominated Marina Fontaine, they have a track record for action-packed, quality publications. For Steam And Country is scheduled to Launch June 15, 2017. It will be available on Amazon. To learn more about Jon Del Arroz, you can follow him at http://www.delarroz.com, on Twitter @jondelarroz or on Gab.ai @otomo. Visit http://www.superversivesf.com for science fiction and fantasy news and reviews, as well as new releases for Superversive Press. I'm really looking forward to reading it.